"The “re-edition” collection of the 20th century French masters. Made in the USA"
Established 2006, Edition Modern is a lighting and furniture company built by designers for designers. Founder, Denis de la Mesiere, is a French native designer and antique dealer with a passion for French Modern design. Over time, he developed a deep appreciation for the works of Pierre Chareau, with his characteristic, raw materials and honest construction of each piece. He fondly refers to Chareau’s work as “a hybrid of light and sculpture”. Before long Denis found himself inspired to create the line himself, here in the states… and the rest is history! We have cultivated an extensive line of re-edition lighting and furniture by Pierre Chareau, Jean Royère and other French modern designers, as well as bespoke products. Pure materials and meticulous execution define our collection. 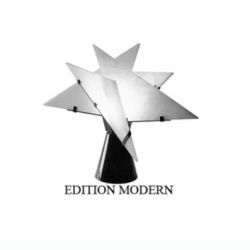 Edition Modern now works alongside the top Interior Designers and Architects in the U.S. to bring our distinctive quality to their commercial, residential and hospitality projects. Our line is proudly artisan crafted here in Los Angeles California, with a few exceptions made in France. In addition to our collection, Edition Modern exclusively represents French contemporary artist and designer Xavier Mennessier. Xavier’s works are made of titanium, featuring a remarkable patination technique that he himself developed, not to mention fluorescent agate inlay detail. Bespoke products also available. All pieces are signed, numbered and made in France by Xavier.